Fall is here with pumpkins in the fields and bright colors everywhere. It’s also time for the annual Fall clean. With winter on the way, it’s time to start preparing now while you can. If you’ve got any exterior wood or composite structures you need to ensure they’re well protected for the colder months ahead. This time is also good for other deep cleaning chores that will get your home fresh and comfortable for the coming months. 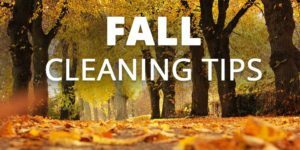 Our Fall cleaning list and tips will help you make the most out of it and prepare for the coming winter. Start by going through all your cupboards and shelves in search of stale food that can be thrown out. This is a chance as well to clean the areas where you store food. Begin by taking out all your cans and boxes and cleaning away any dust that has accumulated. When you’re putting everything back check each item and throw out the ones you don’t need or have passed their expiry date. The safety of your home and family depends on these devices so ensure that they’re worked properly. The batteries should be replaced with fresh ones at least once a year, a good to remember when this should be done is by doing it on Daylight Savings Time. The devices themselves though also need to be cleaned as dust can build up and cause them to underperform. Use your vacuum cleansers soft brush attachment to clean in and around the detectors openings. It’s good to also make this an annual chore every Daylight Savings Time. Flip your mattress around to prevent body impressions from causing it to slump. Sprinkle the mattress with baking soda to neutralize odors and then vacuum it up. This should be done at a minimum once a year. Thanksgiving and Christmas are just around the corner so you’ll want your carpet in top shape for those events. It’s well worth hiring contractors for a professional clean, they’ve got the equipment and expertise to achieve results not possible with store bought chemicals. However, if this is not in your budget you can still get a good job done by renting a carpet cleaning and following some DIY tricks. If you’ve got a wooden patio, deck or seating you need to ensure they’re protected for the colder months ahead. Start with a thorough cleaning of the wood surfaces to remove any dirt. Try to keep any wet leaves off your deck as they can cause discoloration and water damage. What sort of varnish you apply depends on what type of wood you have so make sure you know which one does what. At a minimum, you should apply two coats for best protection. If you have any concrete footpaths, patios or driveways you need to protect them from freezing. Without protection moisture, any moisture in any crevices can freeze and cause cracking. Get a good concrete sealant and apply it correctly. This not only protects against cracking but also prevents it from aging more rapidly.